The more I paint, right or wrong, the more I am less concerned about sticking to one color within a shape and more aware of repetition of numerous colors used within a shape. I realize that repetition is a principle of design but I believe an even looser applicable of color is OK as long as there is repetition. To me it is a more joyful, freer way of painting. I was taught to paint what you see and not what you think you see. However, I think we need to go a step further in that we do not only paint what we see with design liberties but with a reason for painting it. I think we paint better if we have something that we want to express. It is not to say what I have stated below is what I have always been able to express nor have done it well. A flower is not painted as a flower looking at you but is expressing something like the wind blowing it or the sun shining on it or that it is on its last breath or all of the above. Clouds are not just clouds in a blue sky but they express the day and the emotions that you feel in seeing them. A portrait painting is not just the resemblance of a person but an expression of who they are or how they feel. A painting of fruit is not just saying fruit but is an expression of their surface feelings or of the blemishes that they have. Buildings are not just buildings but the character of them and what they have been through during their years. 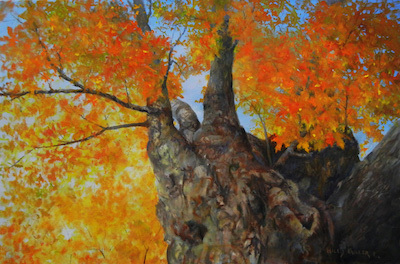 Trees should express their history and not just trunks, limbs and leaves. A landscape is not a perspective view of things but memories of those places, their smell and the feeling of walking, climbing or sitting in such a place. 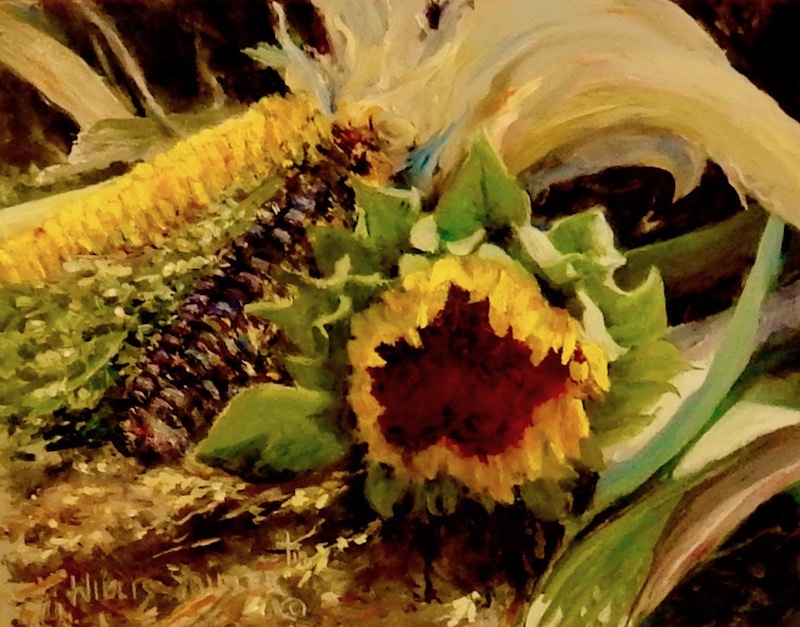 Still life paintings are not just a set up of things but an expression of a relationship of colors, values and textures that make them come alive and become a family. All those things are expressed better with the help of our Creator. I enjoy mixing a big puddle of colors for the colors and values I may use. 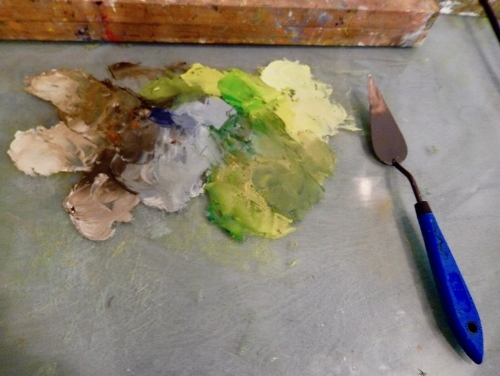 In this puddle are Ultramarine Blue, Raw Umber, Raw Sienna, Cadmium Yellow Light, Viridian and Titanium White. I do not always set up these big puddles but I probably paint better when I do at least at the beginning. Setting up a big puddle makes it possible to create all kinds of subtle colors by picking more than one spot within the puddle. After a time the puddle will become muddy and I will make a new puddle and that puddle will vary in color some. That way the laying of colors and by leaving some underlay colors showing through makes for a better impression of the scene. It is better than painting just formula color mixes, I think. Below are two different value patterns of the same subject. It does not mean you must like it, but I hope it makes you think of all the possibilities of painting the same subject simply by changing where the values lay within your painting. Last week the blog was on the element "Line" and how it can be applied to each of the 8 Principles of Design. This week the element “Shape” we can use as food for thought as it applies to the 8 Principles of Design. Only one principle: Conflict or Contrast will be mentioned. I will leave how it applies to the 7 other Principles as food for thought. Shapes can cause conflict when geometric shapes such as squares, rectangles and triangles and organic shapes such as circles, ovals, etc. are applied to the same painting. How and where they are applied in a painting can involve the other Principles of Design. Below is a painting with geometric and organic shapes. That does not necessarily mean that I did it right. I know this can be mind boggling - at least it is to me. If you take each of the 7 Elements of Design there is the potential to apply each of the 8 Principles of Design mentioned in an earlier blog. In this blog I will talk about probably the least used Element of Design: Line. In future blogs I will probably not cover how to apply each Principle of Design to each Element of Design but will just try to put up some food for thought. These things are not all my own ideas because they have been mentioned in different ways by different people. 1.Balance: How do we keep the element Line in balance in a painting I.e. are lines distributed right to give balance to the painting? There can be formal or informal balance i.e. a formal similar line or lines or informal balance where different types and numbers of lines are used to give the appearance of balance. 2. Harmony: Here we must think about the harmony of line types I.e. lines are similar in ways that give the painting a feeling of Harmony. 3. Gradation: Gradation can for instance be from a thick to a thin line or a dark to a light line, etc. 4. Alternation and 5. Variation: Alternation is like wall paper and Repetition is like maybe repeating the Line several times in the painting but keeping everything in balance. 6. Conflict: For example we may think thick against thin, curve against straight etc. Conflict can bring interest but too much can make the painting seem jumpy. 7. Dominance: Is there more thick than thin, more dark than light, more curve than straight. There are other ways I am sure to apply dominance. 8. Unity: I remember taking a workshop once and the instructor said if you cut your painting into pieces would you be able to tell if they all came from the same painting. Below is a painting I did where I subtly applied lines in a curved fashion within the flower petals to direct the eye in the painting. In the coming weeks the blog will cover some about how each Elements of Design relates to Principals of Design. I learned early on about Elements and Principles of Design and how they relate to each other in painting. I hope to post in future blogs what I have tried to learn about them. That is not to say I know the complexity of it all. I just would like to share a little bit about them. When I painted in acrylic, I used a deviled egg tray with a snap lid for the paints. By putting the different colors in the trays and using the snap lid, it keeps the acrylic colors moist, although occasionally it is good to spray the paint with a mixture mainly of water and a little flow aid. The snap lid serves as the pallet. You can occasionally peel off or wash off the colors on the palette. With this system and 2 coffee cans of water (one to keep the used brushes wet and one for cleaning the brushes), the start up and clean up is fast and easy. A good Deviled Egg Day. I remember showing my first mentor a painting of a cabin I did. She kindly let me know my perspective was off. I then bought a simple perspective book and studied about how the viewers eye level and horizon are the same. I learned about vanishing points and how they can be selectively picked. Then color, value and edges must be considered. Sometimes it is good to remember that tall buildings also have a vanishing point. Color, value and edges could have been done in so many different ways in the painting titled: Farmers Market. Many years ago a teacher at an art workshop said to paint shapes and not things. That really bothered me because I wanted to say paint a tree not a shape. Over the years I have learned that if the various shapes are painted beautifully then the thing is beautiful and more so the reality of what you want the viewer to see. That is not to say that you do not at some time during the painting process think more and more of the thing you are wanting to paint. Below is an image where I enjoyed the creation of a shape that in the end was a tree trunk. The joy is in the shape of things. The other kind of practice is gesture drawing where one rapidly scribbles in a form either still or moving. Try it watching a sports event and do a person rapidly. It is amazing how you can then put edges around them which gives you a much more live form. You are probably familiar with the book Drawing on the Right Side of the Brain by Betty Edwards.